From a very early age we begin to become aware of the severity of our condition as the fallen race of Adam. 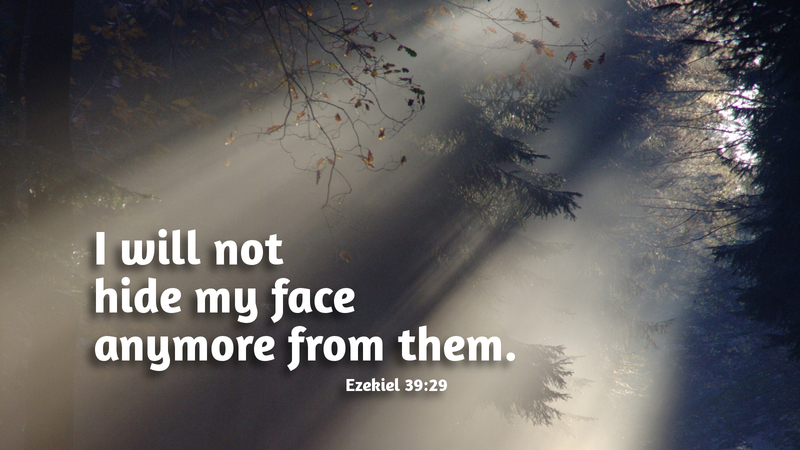 We increasingly experience the shame and darkness of guilt, the foul brood of our sins, which the holy prophet Ezekiel speaks of in today’s reading. In sacred Scripture, the hiding of God’s face, the withdrawal of his countenance, always ushers in darkness and wrath—the chief example being the Father’s forsaking of the Son on the holy cross. This peculiar withdrawal of God’s countenance is, I imagine, as close to hell as one is able to get on earth. Conversely, the revealing of God’s face, the lifting up of his countenance upon us, always floods us with light and life. The Lord, through his prophet, foretells of the age in which we are now living. In Jesus, the Father has turned his face toward us, illuminating our souls and hearts of stone as he breathes new life into us by his Spirit. His glory, Jesus Christ, has indeed been set among the nations as he breathes the breath of his Spirit into us, that through us, he might vindicate his holiness. Prayer: Father, hide not Thy face from me and ever bring me to penitence, that, through the merits of Jesus, I may be a worthy vessel of Thy Spirit. Amen. Today’s devotion was written by Wesley Frye, Pastor of Christ’s Evangelical Lutheran Church, Stanley, NC.